What was the brief for the building? The client asked us to design a building that would become a symbol for Dubai. Sydney has it’s Opera House and New York has the Statue of Liberty so Dubai would also have a building that people would associate with the place. What makes a building symbolic? We looked at the other building in the world that are symbols to see what they had in common. We found that they were all totally unique in shape and they all have a simple easily recognisable form. We decided that the test to determine if a building is symbolic is if you can draw it in 5 seconds and every one recognises it. Why did you make the Burj al Arab building look like a giant sail? Dubai is becoming a world resort location so the building had to say holiday, fun and sophistication all things associated with yachting. This mixed with Dubai’s nautical heritage it seemed an appropriate shape. Why is the building out to sea? It helps it’s uniqueness. It looks like a sail / boat. If it was on shore it would block the sun on the beach in the middle of the day. 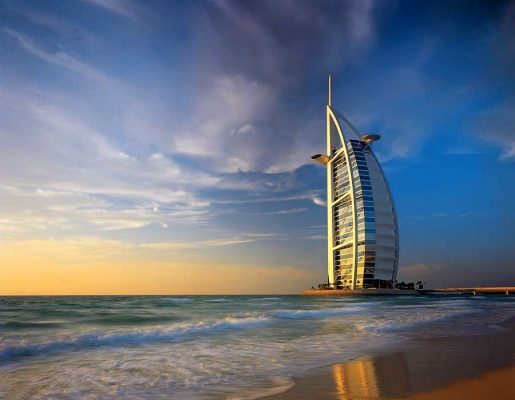 Does the Burj al Arab stand on rock? The building is built on sand, which is unusual as most tall building are founded on rock. 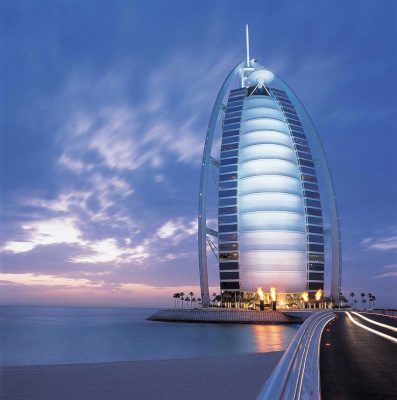 The Burj al Arab is supported on 250 1.5M diameter columns that go 45 meters under the sea. As there is only sand to hold the building up the columns rely on friction. Are there any unusual materials used in the building? The screen that encloses the third side of the Burj al Arab atrium is made of 1mm thick glass fibre fabric with a Teflon coat to stop the dirt sticking. The screen is the largest of it’s type and covers an area of one and a half football pitch and is hung from the top of the building by over a kilometre of 52mm cable. The diagonal trusses on the side of the Burj al Arab building are as long as a football pitch and weigh as much as 20 double-decker busses. They were built 15 KM from the site and brought by road on huge 80 wheel lorries which had to be specially imported from South Africa. The highest truss took a day to lift into place. If one man was to build the building himself it would take about 8,000 years to finish. The resulting form is entirely appropriate for the Burj al Arab and its function with the fabric reducing solar gain into the atrium and providing an effective diffused light quality. It is also appropriate for the Middle-East region where its predicted lifespan and self-cleansing qualities should resist the aggressive environment. An expansion joint is provided for the full height of the building on the right hand side of the wall. 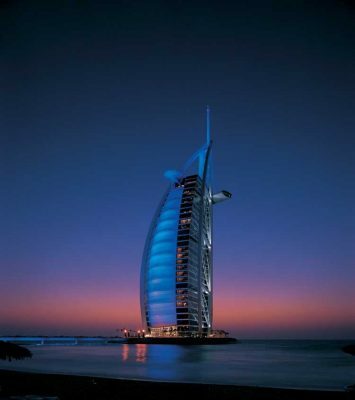 This enables the Burj al Arab building to ‘breath’ under wind loads and avoids the exertion of large horizontal loads on the relatively weak bedroom structures. 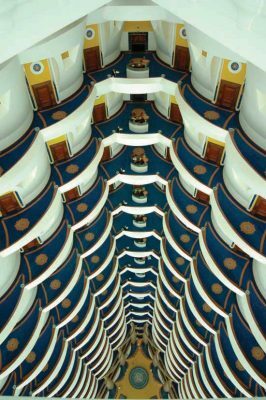 The Burj al Arab’s trussed arches which can extend out from the supports by up to 13 metres are supported vertically at the 18th and 26th floors by a series of 52mm diameter cross-braced macaloy bars. Girders at these floors transfer the load to the core structures. The macaloy bars are anchored at level 1 to a substantial entrance girder which is tied to the lower basement structure. These bars are then pre-tensioned to ensure that the whole Burj al Arab structure remains in tension. The membrane is constructed from 2 skins of PTFE coated fibreglass separated by an air gap of approximately 500mm and pre-tensioned over a series of trussed arches. These arches span up to 50 metres between the outer bedroom wings of the hotel which frame the atrium, and are aligned with the vertical geometry of the building. The double-curved membrane panels so formed are able to take positive wind pressures by spanning from truss to truss and negative wind pressures by spanning sideways. Additional cables have been provided running on the surface of the fabric to reduce the deflection of the membrane. Ring of steel sheet piles. Depth of lowest basement under sea, B3 is -5.000 below DMD (Dubai Mean Datum) ie 7.000m below sea level. Height of top of accommodation from island, 27th Floor (Skyview) is 197.5m above DMD. The island is 7.5m above DMD. Therefore the Skyview is 190m above the top of the island. Number of large cranes used in construction 3. Unusual equipment in best suite: Video on Demand, Whirlpool spa bath, wall mounted body jets in the shower, 54″ plasma TV and surround sound Home Theatre system, Door intercom & video camera display on room TV, Electronically controlled curtains, Toshiba Satellite notebook computer, 9 No. telephones, video conference facilities, fax, printer, scanner, lighting scene dimmer system, light projector clock, single touch night light system from bedroom to bathroom, 2 minibars, mirror on ceiling above bed, DVD player, portable touch screen controller for all room entertainment, curtains and information systems. Number of Atkins staff on site at peak 150. The external fire and water features are associated with the arrival experience starting at the approach bridge across to the manmade island site of the Burj Al Arab Hotel. The concept is comprised of two major components: two pairs of monumental fire towers frame a “gateway” into the arrival court, offering spatial definition to the space, and an elliptical cascade element centred in the vehicular loop, incorporating a variety of exciting water, fire and lighting displays. The fire towers are abstract, architectural forms that work in concert each half-hour to produce a rhythmic pattern of powerful rising spherical balls of burning flame. The central ellipse is set in an elegant circular blue granite pool. Overflowing water sparkles white in the sunlight as it skips down the stepped slope of its granite walls. The perimeter of the top of the cascade is dressed in a tightly spaced ring of kinetic jets -MicroShooters®. The core of the plan is occupied by a cluster of MiniShooters®. These are powerful water jets capable of achieving great height. Running through the long axis of the ellipse, addressing both the hotel and the bridge approach are a row of WETFire® nozzles. These intermingling water and fire displays are a totally new and exciting centrepiece in the Burj al Arab hotel design. All of these richly choreographic displays are internally illuminated in white or coloured lights at night. This feature is conceived as a water sculpture that visually engages the visitors to the hotel. Centrally placed within the atrium space, the water feature is circular in form and is composed of 24 No. white fibre optic lit water arches (Leap Frogs)® that surround a gently sloped bowl of multi coloured crushed glass aggregate. A powerful column of water, the HyperShooter® is surrounded by 6 No. smaller “Minishooters® forms the central focus of this feature. The sloped plane of the catchment bowl terminates at a shallow pool in the centre of the feature. Arising from the bowl and encircling the sloped plane, the laminar streams create water arches in interlaced geometries. Illuminated by both uplights and white fibre optic lights, these water streams create crystalline water arches within the Burj al Arab Atrium space. Periodically, as part of the choreographic sequence, the HyperShooter® erupts from the shallow pool to a height of thirty metres, like an in door geyser. This energetic column of water shatters into a myriad of sparkling droplets and is illuminated by a ring of white uplights. The HyperShooter® is adjustable to project the water column to a maximum height of 50m up into the atrium space. This is a spectacular waterfall descending a total height of seven metres, split into unequal height steps, increasing down the down the slope to create a three dimensional elliptical surface. In plan Fan shaped in plan and located between the 2 No. Escalators that link the Burj al Arab Hotel’s Ground and First floors, the waterfall is dramatic both visually and kinetically. The use of brightly coloured crushed glass aggregate, contained in eighty varying sizes of diamond shaped water catchment tray, combine with a stimulating light show to create the ultimate ‘wow’ factor on first entry into the Burj al Arab Atrium Lobby. The feature comprises controlled falls of water over the diamond tiers of glass aggregate onto inclined grooved green/grey granite slabs, which create a shimmering water skin as a back drop to the active laminar stream presentations on each level. The feature contains 24 pairs of coloured fibre optic lit Leapfrogs® ; each pair designed to collide creating a bright “spark” effect as the fibre optic light disperses at the intersection point. The “spark” is further highlighted by dimmable coloured uplighting. Operation of both features is computer controlled to choreograph an array of different sequences and patterns of the display. Light and movement are combined with the sound of the impacting water streams. In fact, parts of the sequence sound like a chorus of hand clapped rhythms, adding to the ambience and interest created in the vast space of the Atrium Lobby. Even when viewed from high above at the top of the Burj al Arab’s Atrium, the colour and light of the features form a delightful pattern and focal point for the whole space.